Labuan International Sea Sports Complex is located at the waterfront area along Jalan Tanjung Purun. It is within close proximity to Labuan town center. is the Labuan International Sea Sports Complex. Part of the beautification project under the 7th Malaysia plan, the complex covers an area of 5.91 acres and was built at a total cost of RM25 million. 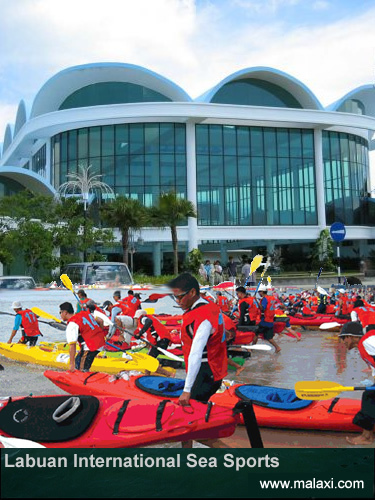 With the objective of creating a world-class water sports centre and developing more attractive places of interests in line with the Malaysian Prime Minister’s vision to turn Labuan into a major island destination, the sea sports compled was completed and opened to the public in June 2001 when it hosted the yearly Labuan Sea Challenge 2001. The Labuan International Sea Sports Complex was designed with three prominent structures connected to a main viewing plaza. Each of these imposing towers is an integral part of a large modern water sports complex. The complex not only possesses an interesting architectural design, it also houses modern infrastructure and facilities which will enable the island to host more international sea sports events and championships. The complex houses the main sea sports centre, an administrative block, a marine biology museum, souvenir shops and eateries. Labuan International Sea Sports Complex is part of the Labuan waterfront beautification project. Its objective is to create a world-class water sports center and to develop more attractive places of interests in line with the Malaysian Prime Minister's vision to turn Labuan into a major island destination. 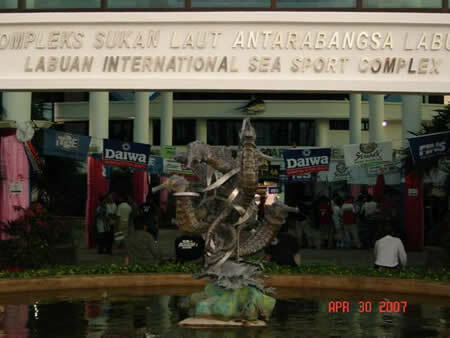 Labuan International Sea Sports Complex opens to the public in June 2001 when it hosted the yearly Labuan Sea Challenge 2001. The improved infrastructure and facilities provided by this complex is expected to enhance Labuan's appeal to attract more tourists and investors. The modern amenities will enable the island to host more international sea sports events and championships. The Labuan International Sea Sports Complex is designed with three prominent structures connected to a main viewing plaza. Every building houses a specific activity. Each of these imposing towers is an integral part of a large modern water sports complex. The architecture offers a dramatic expression of nature, tradition and modern functionality. The complex houses the main sea sports centre, an administrative block, a marine biology museum, souvenir shops and eateries. This is a center for major sea sports activities and a venue for carnival. There is a large boat storage area that allows direct access to the beach front. There are also facilities for changing room, rest area and general preparation. It serves as a permanent exhibition area for all type of sea sports activities. It connects to the many "leisure walks" on the beachfront. The Museum of Marine Biology is sited together with the Administrative block in a separate building. It takes the shape of a semi circle fronting the sea with an open gallery. A large part of the building space is used by the Maritime Museum. While the rest of the space is for administrative use such as meeting room and office spaces for sports bodies. The podium level contains comfortable resting room for VIP and additional gallery space for museum. The main plaza is circular in shape. It is equipped with an all weather windbreaker structure to withstand any adverse weather conditions. It serves as a centre stage to launch and view all type of sea sports events. The handicraft centre and eateries are located on the west wing of the complex. The many fast food stall and small eateries selling local fares, plus the many souvenir and handicraft shops, make this place a hive of activities. It is a popular stopover for visiting tourists. The Labuan Sea Sports Complex is located along Jalan Merdeka, close to the Labuan Tourism Action Council. For more information, please contact the Labuan Tourism Action Council office at 6087-4226622.